I walked through Crown Heights a few days ago and came across this odd mobile police unit. Students in my class knew exactly what it was: a M.U.S.T. – a mobile utility surveillance tower. It can be moved to a “place of interest,” a platform elevated from the base, flood lighting, infrared cameras – all monitored by one officer in the lifted hub, the driver’s seat of the van, or, I believe, remotely. If chaos ensues below, that person can call in extra troops with the push of a button from the encased hub, without having to exit to the street. The 21st century version of Jeremy Bentham’s panopticon, on a city corner near you. Incarceration is not my field of expertise, so I will be learning from my friend Micol Seigel, my colleagues Jeff Smith and Eric Anthamatten, the many university partners in the collective led by Liz Ševčenko, and, most of all, students in the class. 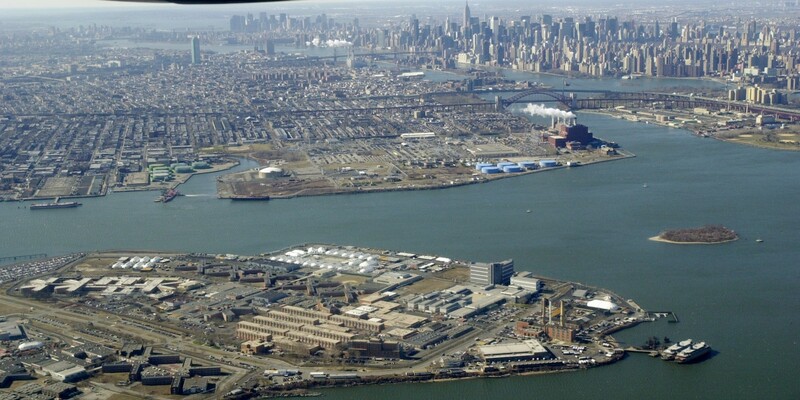 The picture below projects the aim: how does our view of New York change if we put Rikers Island in the forefront?